The connections of Saganaki are hoping the third time is a charm when the young gelding lines up at Port Macquarie this Sunday. 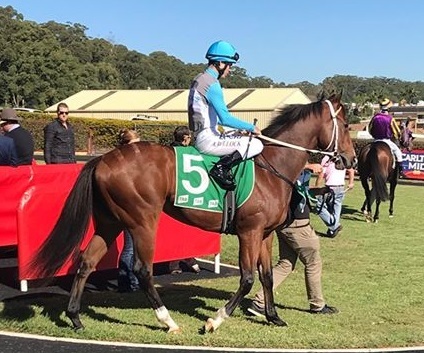 He ran third on debut at Port Macquarie in mid-May and followed that up with a close 2nd at Taree on 1st June when he buck-jumped out the gates losing three lengths but managed to finish less than half a length behind winner, Taken On Chance. Saganaki heads out for his debut with Aaron Bullock in the saddle. Credit: Nardi Beresford. Saganki steps out to a more suitable 1506m in the NBN Maiden Handicap, having previously shown he wanted more distance when racing over 1200 and 1250m. He’s the only two-year-old in the field but Lees isn’t concerned. “It’s not ideal to be taking on older horses but at this time of year I don’t think it’s as big an impost for two-year-olds,” Lees said. “He’s drawn a nice gate (5). Port Macquarie is one of those tracks where you have to see how it plays on the day but Saganaki has his regular track work rider, Aaron Bullock, on board and they’ll work it out together. Saganaki is the first horse to hit the track for the MiRunners program which makes ownership affordable by dividing each racehorse into 1000 shares. Saganaki has 400 owners from all over Australia and overseas, as some have chosen to buy more than one share. A big group of connections was there for his debut in May and an even bigger band of supporters is expected trackside on Sunday. Kris Lees will also saddle up Funky Farm in the same race. The three-year-old gelding has been allocated the top weight of 59kg, half a kilogram more than Saganaki. View the fields, form and race replays for Sunday's Port Macquarie meeting here.